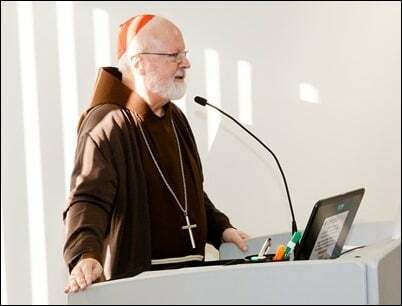 On Thursday and Friday of last week, Cardinal Seán O’Malley of Boston hosted a meeting of Massachusetts religious leaders and climate scientists to explore the possibility of taking joint action to address the challenge of climate change in the Bay State. Full disclosure: I helped organize the thing. Last summer I happened to be discussing religion and climate change with Philip Duffy, head of the Woods Hole Research Center, internationally acclaimed as the world’s leading climate research lab. Duffy, who oversaw climate policy in the Obama White House, suggested getting such a coalition together. I agreed to lend a hand. At a time when the national government is headed by an Administration determined to undermine existing policies to mitigate climate change, action at the subnational level—state and local—looks to be the only way forward. Where better to start than in Massachusetts, with its concentration of scientists and a faith community whose most prominent member is the North American prelate closest to Pope Francis, author of a clarion call to action on climate change? We are moved by the Appeal’s spirit and challenged by its substance. We share its sense of urgency. This invitation to collaboration marks a unique moment and opportunity in the relationship of science and religion. The hoped-for collaboration never took place. The result instead was the National Religious Partnership for the Environment—an interfaith organization. But, but….abortion, cake bakers forced to bake cakes for gay weddings. You have to vote Republican. It is the only way, even if it desecrates the earth. And what does it matter anyway if forests are clear cut or wild life is killed in oil spills, if someone gets to make millions on the deal and those of us who want new kitchen cabinets and floors as household “fashions” change and want to drive our SUVs – if we can pay for it, hey, that is capitalism. And we all know that God shows His favor by rewarding those who follow Him and His rules – He makes then rich and the richer they are the more it is clear they have God’s favor. And, and – who really does believe in capitalism and rugged individualism but Republicans???? then you’re enjoying the use of good ole fossil fuels. Lots of it. Today. “According to the genetic and paleontological record, we only started to leave Africa between 60,000 and 70,000 years ago. What set this in motion is uncertain, but we think it has something to do with major climatic shifts that were happening around that time—a sudden cooling in the Earth’s climate driven by the onset of one of the worst parts of the last Ice Age. This cold snap would have made life difficult for our African ancestors, and the genetic evidence points to a sharp reduction in population size around this time. In fact, the human population likely dropped to fewer than 10,000. We were holding on by a thread. If you drive a car, do you really need to? There is frequently an attitude of putting oneself first b y insisting on the need to drive when transit is an option. Or one’s two feet. – even better as an antidote to obesity, lack of physical fitness and heart disease. Better for air quality too. Walking builds a sense of community and provides an opportunity for spiritual reflection. Cheaper to take a cab than to own a char for the purpose of grocery shopping. Use a ride share service. But even most taxicabs, buses, cars, schools, stores, daycares, offices, jobs, and houses of worship, run on fossil fuels, yes? Not solar, not wind. These global warmers aren’t thinking about the impact of their ambitions on many folks. A Roman Catholic Prelate speaks of ” moral authority ” ! Comparable to ” grab em by the p-ssy ” and ” believe me ” Trump, speaking at a prayer breakfast. The RCC in it’s death throes is seeking identity with science, as it’s last gasp at legitimacy. A lot of conjecture as the cause of climate change/global warming as to what is causing it . One could speculate, for example, that it is simply due to more active volcanoes under the oceans which is something we have no control over. Then there is that ball of energy aka the Sun that is slowly expanding and gets closer every year. Again something out of our control. Are these global warmers trying to immediately get rid of fossil fuels? I don’t think that is the plan. Rather they are advocating for a long term solution to reducing the use of fossil fuels in lieu of more renewable energy sources. Where is the harm?